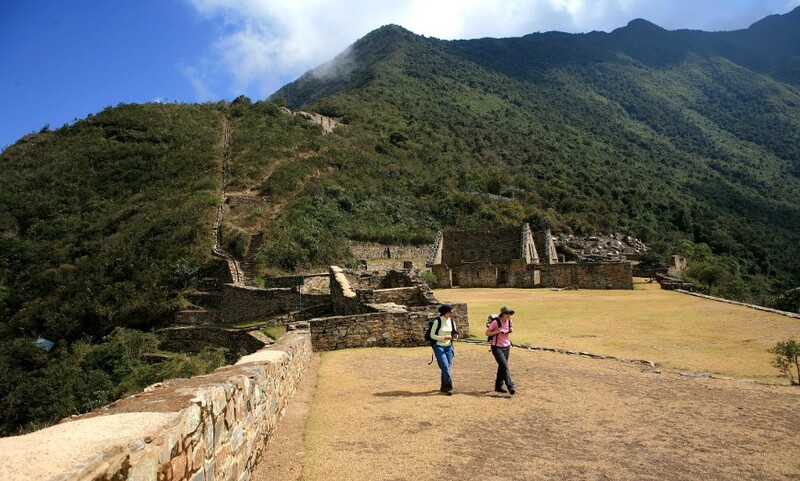 Choquequirao Trek to Machu Picchu, Grandiose and mysterious, this abandoned city has lots of parallels with Machu Picchu and there are a variety of theories about its function and purpose. 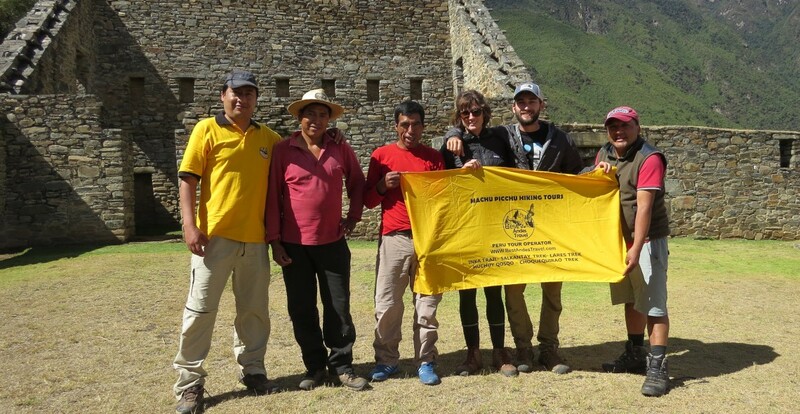 It´s only relatively recently, however, that COPESCO (the official body responsible for tourism in Peru) has partially uncovered the site and there still remains a lot more to be discovered. 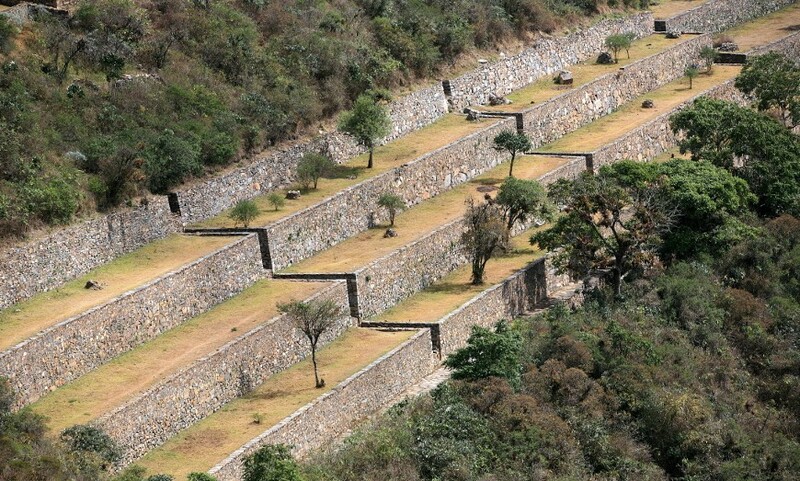 Lying in a cloud forest, a dramatic 1150 meters above the Apurimac River and surrounded by the fascinating landscape of the Vilcabamba mountain range, Choquequirao has everything to offer an adventure trekker. Due to its remote location few tourists have visited this site so far. 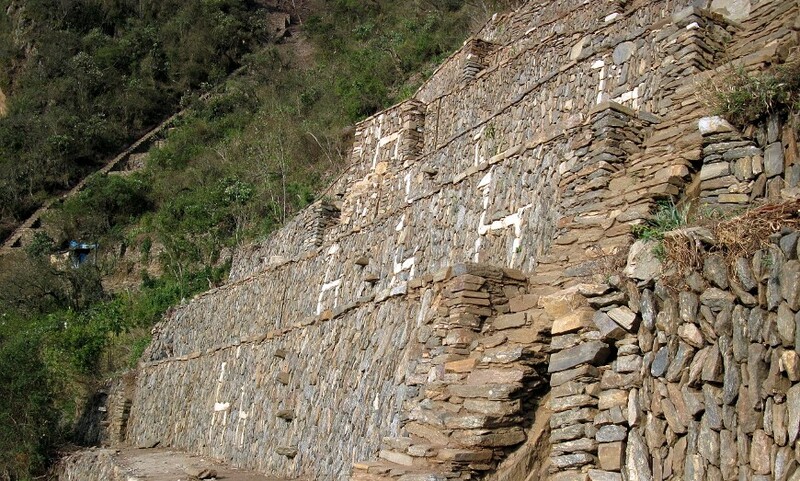 Fortunately, COPESCO have now also constructed a footbridge over the Apurimac River, below the site – making it more accessible. 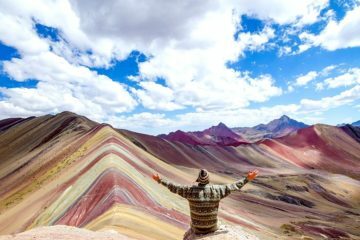 It is a challenging but truly rewarding hike down to the depths of the Apurimac Canyon and then up to the site – in the clouds! We pick you up from your hotel at about 8am and travel by bus for about 4 hours to the small village of Cachora where we will meet our horsemen and mules. 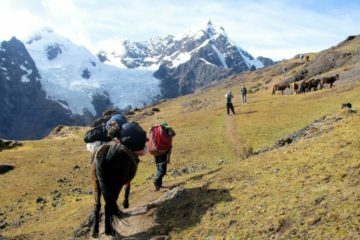 We begin our trek along the edge of the Apurimac canyon and follow the trail, enjoying the dramatic landscapes and a variety of plant and animal life along the way until we reach our campsite at ‘Santa Rosa’ (1650m). We get up early, have breakfast and begin our walk by crossing the Apurimac River and then descending to the lowest point on the trail. 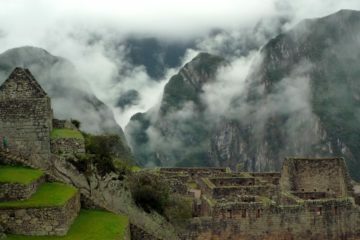 Following this, we have a steep ascent through a thick cloud forest heading towards Choquequirao. 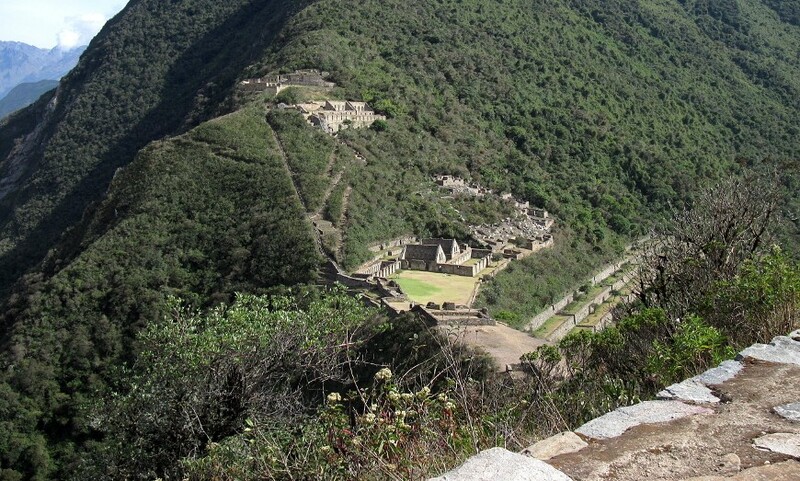 We will have lunch and then time to relax and enjoy the archaeological zone, plants, animals (hopefully condors!) and views of nearby canyons and snow-capped mountains (Soray – 5428m and Tuncarway 5910m). 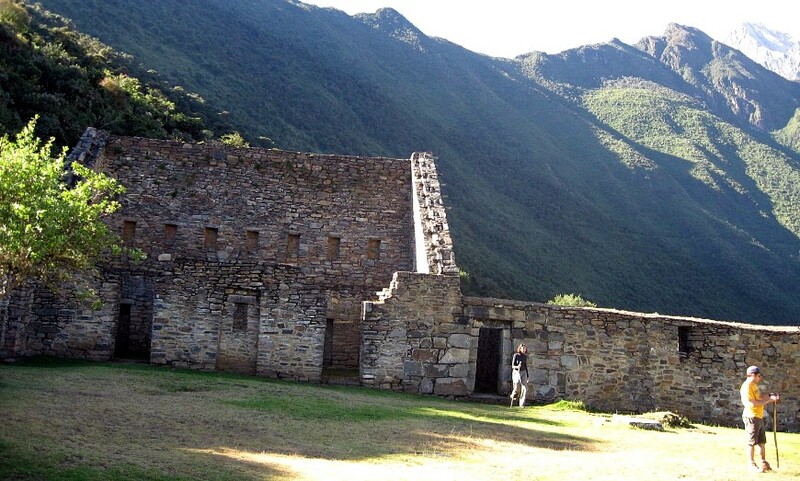 We will camp in Choquequirao itself (3033m). More or less 5 hours walking this day. This day we will have an early breakfast followed by a 3-hour guided tour around Choquequiraw and free time for you to explore and take pictures at your own pace. After this, we descend to our last campsite in ‘Chiquiska’. More or less 6 hours trekking. We wake to the sound of birds chirping and a beautiful scenery before us. We walk to Cachora (6 hours more or less) and from there take a bus back to Cusco to arrive there at about 8pm. INCLUDED Collection from your hotel in the morning of trek departure. Professional guide (you will have an assistant guide for groups over 8 people). Tents – 2 people in a 4 person tent which allows for greater comfort, and also storage of backpacks. Meals as indicated 3 breakfasts, 3 lunches, 3 afternoon snacks (hot drinks, biscuits and popcorn) and 4 dinners (breakfast on day 1 and dinner and lunch in Aguas Calientes on the last day are not included) (optional vegetarian food). Our professional cooks prepare meals that incorporate elements of the western diet and also traditional Peruvian delicacies. (Please communicate with your guide/cook during the trek if you have a preference for certain types of dishes). Salads, if served, are washed in boiled water. Hot coca tea every morning in your tent for a gentle and fortifying wake up! Hot water every morning and evening for washing purposes, and boiled purified water to fill in your water bottle every morning. Horses (for equipment and personal items) including horsemen. They carry camping equipment, food and kitchen utensils. We provide duffel bags at your briefing for your personal items (up to 5 kg per person). If you wish to take more, you can hire an extra mule at a cost of $10 per day. Tents for our staff to sleep in, sleeping bags & mattresses plus a budget for their meals. First aid kit including emergency oxygen bottle – but not blister treatments as known in western countries. NOT INCLUDED Extras drinks and beverages. Any personal equipment, clothing, backpack, etc. Warm clothes, including jacket, fleeces, gloves, scarf and beanie/touk.Thermal clothing is also recommended, especially for sleeping. My husband and I treated ourselves to a guided trek, and we couldn’t be happier with this experience. 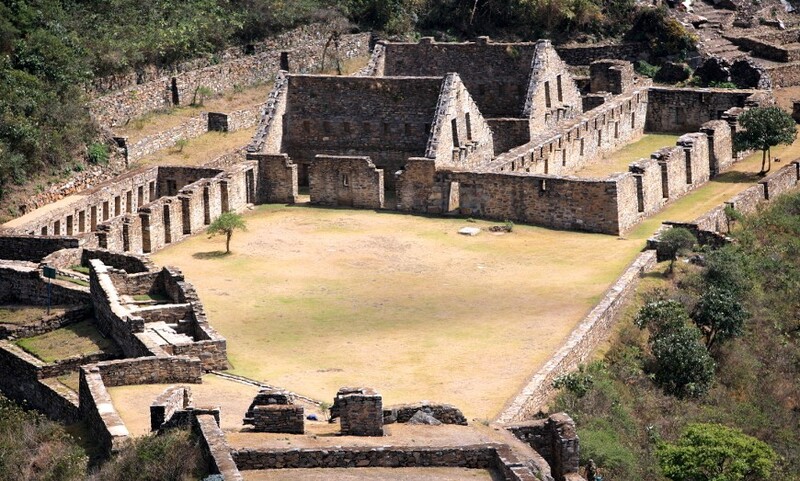 We had the pleasure of Carlos as our guide and he was full of so many interesting facts and knowledge about the ruins. That alone made the experience worthwhile. He tailored the trek to our speed and we were able to spend a little extra time around Choque (this isn’t a site you want to skim over and we were so happy for the extra time). Our chef created some of the best meals we had in Peru 🙂 and they respect dietary concerns. Beyond that, we had a lot of fun. Thank you Carlos and team for the fun adventure and helping us learn some incredible history and culture!